Aaron Clark welcomes us aboard "Four Wishes" and instantly proves to be a kind, hospitable captain who adores his boat with which, thanks to his highly professional skills, he managed to win the Fraser prize this year for best charter captain. The award was presented to him in Monaco at an official ceremony. Captain, how are candidates selected for the prize? The competition is open to all yacht captains belonging to the Fraser fleet, (with no limit on length), that charter in the Mediterranean in the summer. It has been held in Monaco for 4 years now and the score system is created on the basis of feedback from clients and the final decision from the Charter Marketing Management. How long have you been a captain? And how long have you been captaining "Four Wishes"? I became a captain at 18. I have been working on "Four Wishes" since the contract was signed for its construction in 2002. I was greatly involved in the work because the Palmer Johnson shipyard went bankrupt when the construction of the boat was only a quarter finished. The boat owner and myself had to continue the building work in the shipyard and it was extremely hard work to finish the boat, later acclaimed as one of the most beautiful boats in the world. It was launched in 2004. We joined Fraser Yachts right from the first charter in August that year. I have chosen Fraser for its marketing programme, unequalled professionalism, strategy and lastly the enthusiasm with which one works with each part of the group. They are real leaders in this field. What led you to become a captain? I come from New Zealand and I lived in a small coastal town. Water activities took up a large part of the school programme. There were only 110 of us between the ages of 5 and 12 and the sea was just 400m from the school. In summer we had an intense sporting programme in the ocean: kayak, sailing and swimming. At the age of 8 I had already started competing in the Optimist category and with P-class yachts, and was champion of my yacht club for two seasons running. From then on, I have always sailed with a wide variety of yachts. My father was a fisherman and as a young boy I went with him in his boat to help support my family and thus gained the experience of a seaman right from an early age. Apart from these experiences in my young age, the ambition to captain a yacht came from the desire to make my mark in such an unusual field, where all the sacrifices I have made have been fully recompensed. What has been the strangest request made by a passenger on board? The strangest request that comes to mind was when I had to take a group of surfers, who had called me at 10 o'clock in the evening while we were anchored at a great distance, off a small Caribbean island. The five guests wanted to surf at 9 o'clock the following morning on a small beach close by. In fact, I managed to go and pick them up and get back in time to ensure that at 8.45 the next morning they were all in the water with their windsurfs. Where do you enjoy chartering most? In winter, in the Caribbean with a base in St. Marteen; in summer, in the western Mediterranean and Croatia. What is your favourite itinerary? In winter in the Caribbean, I do 7 to 10 day itineraries, stopping off at USVI, BVI's Anguilla and St. Barth's. Guests can enjoy a vast mix of culture, water sports, unpolluted bays, magnificent scenery, life in touch with nature as well as shopping. We should also remember how easy it is for guests to reach the boat. In the summer in the Mediterranean, Sardinia and Croatia offer the best one could expect from this part of the world: magnificent beaches, vast open spaces for sailing, typical countryside, good shops, fine restaurants and other excellent opportunities for enjoying themselves ashore. Do you personally select your crew? What skills are needed? I choose the crew members and look for able people; I train them on board so that each one can improve their skills where most needed. A good attitude and genuine enthusiasm are the qualities needed to work with the crew on board the "Four Wishes". I presently have a crew of 10 and all of them are highly motivated and collaborate by helping each other, a real team. I play the saxophone, love scuba diving, enjoy travelling to interesting places, cycle, horse ride, run and sail. Unfortunately, I do not have a great deal of free time but as my girlfriend now works on board we try to find the time to enjoy our favourite activities. Previous captaining experience: I started working as a captain when still a youngster on fishing boats and moved on from there to captain private yachts and charters. Yacht's main characteristics, (design, interior layout, technological and structural plants): 5 cabins created for charter from a design and construction point of view. Highly technological instruments on board. Aluminium hull. Interior design (colour, material, decorations, lights): interior design in oriental style (Japanese), wooden floors, cherry wood finishing, leather ceilings. Computerised lighting system. Which innovations in the yachting world have most impressed you and why? Advanced satellite communication, because it makes running the yacht so much easier. Your worst experience as a captain? I have had to deal with testing situations, but nothing particularly dangerous. The most pleasant memory you have of your carrier as a captain? This is something that occurs regularly aboard when people share special experiences, forming friendships and relaxing together. 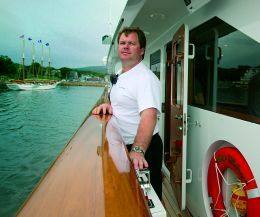 What do you think of your role as captain and the yachting world where you find yourself working? I think that the legislation to protect the environment is very important and that every captain should respect it in order to defend the marine environment. We are all aware of natural beauty and should be the first to show an example.